The bonus calendar doors are back, and to account for the time that they were away, the calendar (and ONLY the calendar, not the leaderboards, no need to worry about guild shuffling being impacted) will be extended until 3pm CST on Tuesday. Please note that due to a UI issue, you will see your keys listed in the shop instead of your tickets unless you have spent all of your keys, but your tickets ARE still in your inventory! We're aware that the second row of calendar doors has disappeared and are working on a fix. The fix will likely come sometime this weekend (ie not tonight) due to some awkward maintenance timing. We apologize for the inconvenience! No offense, but I don’t know anyone who used the second row as they were basically impossible to get for most of us. Do you mean the super doors only accessible if you spend gold keys that would appear below the row of bonus doors? The event says it has 3 days left. Who actually opened the second row of doors? 1 gold key for 20 Zola tokens. What a rip-off. That’s equal to 40,000 tickets or 5,000 gems? it will be fixed 2 hours after the event ends. I used my 2 gold keys on Day 1 normal and bonus doors. Got Zola 1* and the blue rune since u almost never see good blue attack runes. Worth it. You would be supr8sed at how many spend on gold key. DB is rolling in cash with these money grabbing events. This is the worst game I've ever played, in terms of how you handle bugfixes. You want our money but you can't even handle the game... You think about extending the event because you fu... up the calendar doors!? Guys, this is a 18!!!! days pvp event and you consider to extend the event! Did you ever play this game? Stop this insanity!!! Send your staff to some programing trainings! People gettin tired and quit because of this bulls....! Just two words greed and incompetence! @Joel @xtmn8r help, our tickets are gone at reset, we shpukd have had another 24 hrs to spend them, fix ASAP!!! Nevermind, use/sell off your extra keys and the tickets are back. My tickets are gone and my doors look like this. You guys can't do anything ringer, can you? Do anything right, can you? @mrdahl Are you still not seeing your bonus doors? And your tickets are still in your inventory, there just seems to be a UI issue that is showing key numbers instead of ticket numbers. I did not see the event extended, so spent my tickets 5 minutes before reset. Since I read the forum I saw the message that it would be fixed on the weekend. Since someone in the forum posted a PM from xtrmna8r that it would be fixed today I naturally assumed before reset. If there was an extension, we needed to know about it before the end of the event. Not a real problem for me, it just means that you will have many users who could have made more purchases had they been aware of the problem..and the proposed solution...and the progress on that solution. It really only hurts Boss Fight' bottom line. I thought the event was to be extended, but I spent my tickets 5 minutes before reset because I didn't hear anything and the event shop items were timed to expire at reset. After reset, the bonus doors showed up and the event shop items have negative timers. There is no indication how long the bonus doors and event shop items will be available. There really should have been some sort of in-game indication about this well before users would have made their final purchases. P.s. I just noticed there was a pvp event. I know I'd heard a few people mention something about a pvp event in the forum, but I saw no banner and did not think of checking the leaderboards. Did I miss an in-game banner or mail? I might have just assumed end-of-event. If I missed it, I assure you much of the player base may have as well. 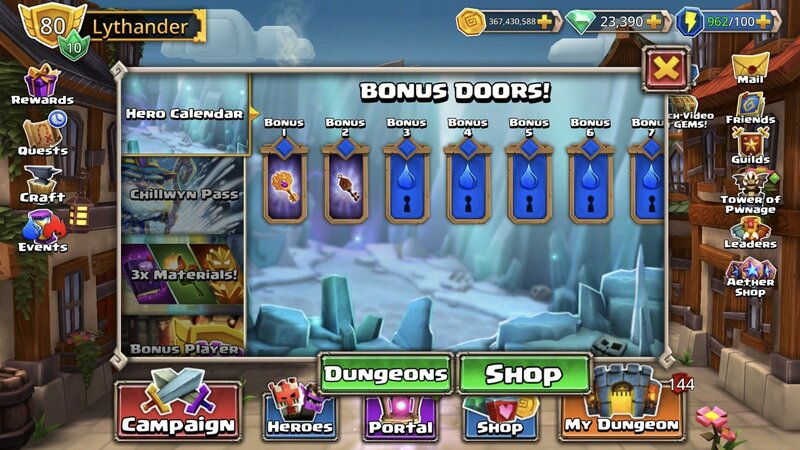 My second row of doors disappeared again once I bought a gold key for 5k gems. Now I have a good key I can't use because the second row disappeared...is this coming back?? @joel, I have the same behavior as MrDahl. No super doors displayed, and in the event shop it is showing my Gold Key countninstead of event tickets. 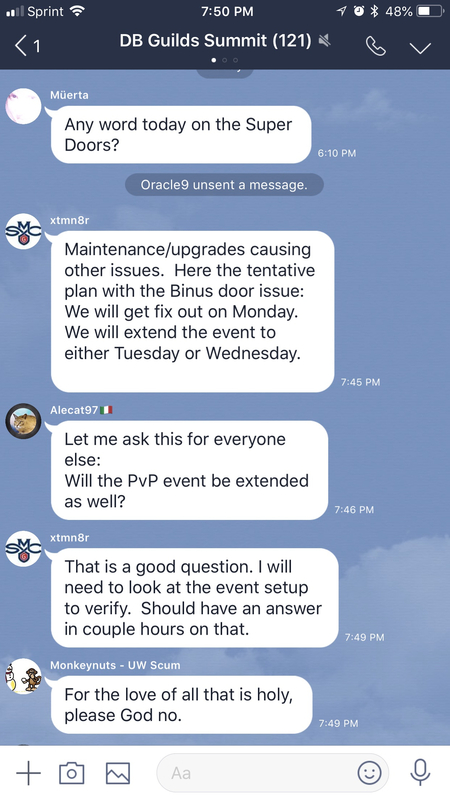 We think we have a fix for some of those experiencing issues with the door again and have extended the doors ONE MORE DAY (Wednesday) to give players who had an issue a chance to still engage with it. Also, in regards to the Rune Gold Key Quest from Xtmn8r: "Once this events, and I swear it will end someday :-), we will look at what everyone did for the event and send them their Quest Rune. Not easy to do th Rune on our end so give us a few days to get the Comp prepped for it." @Joel the second row of doors has disappeared again. Will they be coming back? I purchased the gold key special and now don't have the doors I want to open them with. fool me twice, can't get fooled again. Not complaining when i say this, but I think its just time for us to move on. Let's not do anymore doors. Let's do something else. Let's make it easy. It's not worth it to tie up a developer's time. It's not worth it to yell at Joel. Boss Fight isn't making any money off of it. We should just let the timer run out, and move onto the next event. Cut our losses. It would be easier if the developers had a look at who opened the 1st door for the double attack unbreakable heart rune and just donated it for their troubles (I did not open that door with a gold key btw - I am not interested in that rune). If people get mad that they cant't get their rune, maybe offer it as a grind-able, pvp rune, or inexpensive exclusive offer later. Refund key purchases with gems. Continual disappearance and reappearnce of the doors will just make people more and more mad. It's not worth it. Just another nerd in the herd! All my doors are gone. Is it finally over? the devs wish to apologize for this, and will restore the doors as soon as possible.